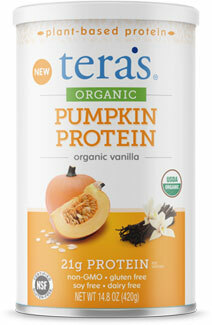 Tera's Organic Pumpkin Protein is a delicious certified organic vegan protein made from cold pressed pumpkin seeds that's GMO-free, dairy-free, gluten-free and soy-free, making it a great choice for those with allergies, too. With 21 grams of plant-based protein in every serving, it's low in carbohydrates and contains 4 grams of healthy fiber as well. This tasty vanilla protein is a great addition to your morning smoothies, post-workout shakes, or as an anytime drink to incorporate more clean protein into your diet.